File Types: ZIP,PDF,All Files; File Size: 23.39 MB; Columns: 2; Min Browser: IE 8+Firefox 14+Chrome 19+Safari 5.1+Opera 12+. We included several responsive Joomla modules with this template. Hot Swipe Carousel, Hot Slicebox, Hot Responsive Lightbox and Hot Maps v2.0 module (new version). All these modules are included with this template without additional fees (you save $15 per commercial module). There are also some third party's extensions included. Free version of J2 Store component is used of e-commerce. Rapid Contact module is used for the contact form in footer. They are styled and configured for this template. 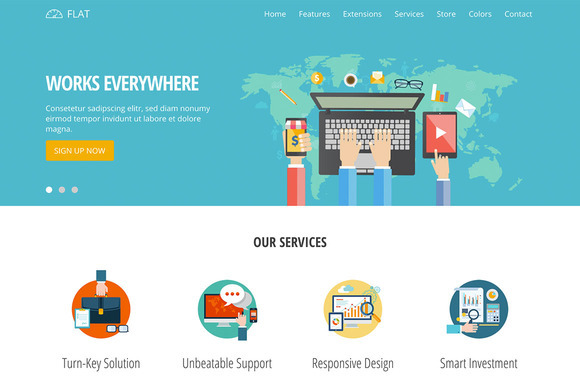 Keywords: joomla, joomla template, responsive, responsive joomla template, slider, flat, html5, css3, business, clean, ecommerce.